1. Old border Šentilj/Spielfield (E59)–Pesnica–Maribor–border Macelj. Maribor bypass road/highway is under vignette. 2. Old border Šentilj/Spielfield (E59)–Pesnica–Lenart–Ptuj–border Macelj. 4. Gornja Radgona (Bad Radkersburg)–Murska Sobota–Lendava–Border Mursko Središće. 5. Dravograd–Slovenj Gradec-Celje-Krško–Small border Bregana or border Harmica (2,5 h drive). 6. Sežana-Divača–road E61 to Kozina-Border Pasjak. 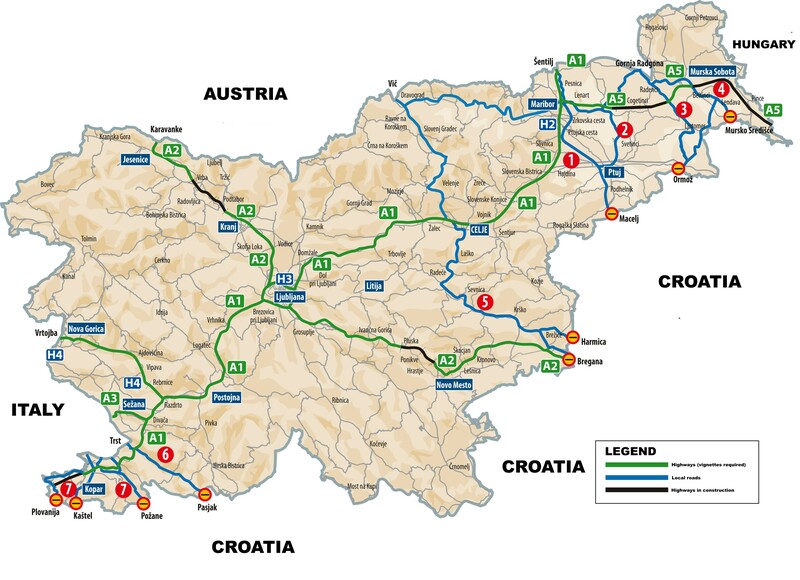 Here you can see high quality road map of Slovenia. All tolls are approximate and for information puroposes only.